TEMPERATURE CONTROLLED UNITS ARE AVAILABLE IN HUDSON! We have locations in Hudson WI, River Falls WI and Somerset WI for all of your storage needs! Garage: We have the place for your vehicles, tools and ladders and much more call to talk with us about the pricing of our storage, you will be happy you called. Many of our customers are happy they called as our prices are lower than our competition. Basement: With cleaning out the basement you often run into more stuff that you can store…the question is if I want to keep the stuff where should I put it? Eagle Mini Storage is a perfect solution to your storage needs. College: Going to school and don't want to take home all of your stuff each year a mini storage unit could be the perfect solution for your stuff call us for availability on a storage unit for your college stuff for the summer. Sales Reps: Is your spouse tired of you leaving the samples boxes in the garage or the basement? Tired of parking your car outside because you have too much inventory in your home office? Call us and we can help clear out the clutter in your home! Are you looking for Temp Controlled Storage in Hudson, WI? 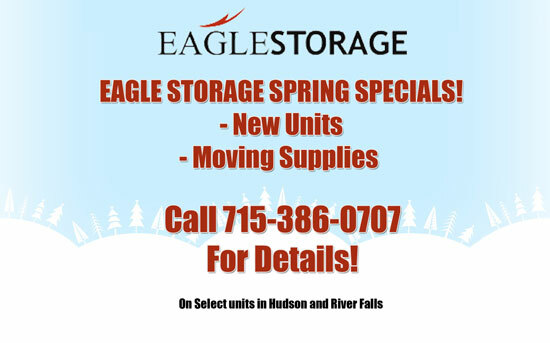 Available – Temperature Controlled Storage Units in Hudson! Various unit sizes ranging from 5x5's to 10x30's. Is Temperature Controlled Storage Right for You? Some of your items are valuable, one of a kind or environmentally sensitive and would benefit from climate controlled storage. Climate Controlled storage units keep items in a constant environment (temperatures between 55℉ and 80℉). To ensure climate control, our storage units are enclosed and, therefore, resist dust, pests, humidity, and more threats to valuables.